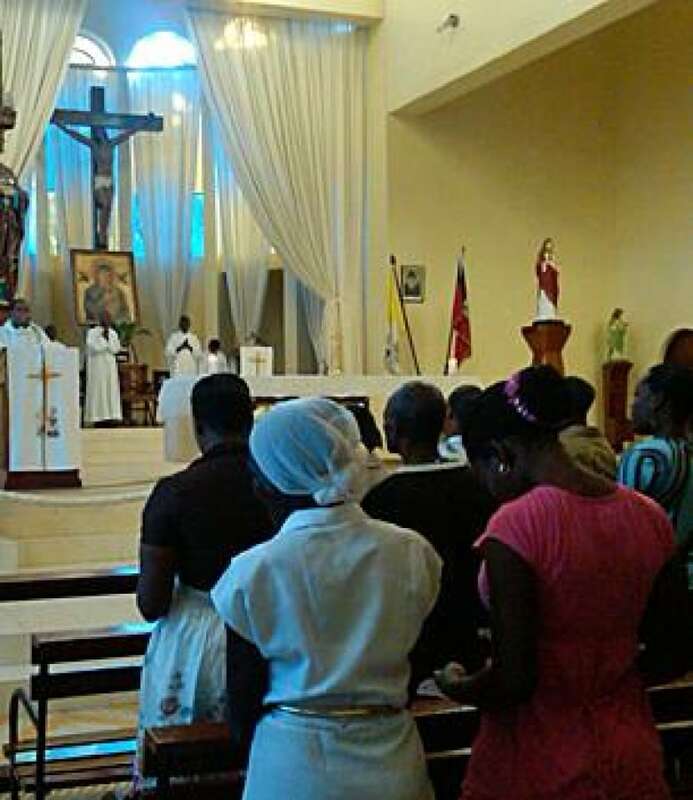 Haitians held a moment of silence Wednesday afternoon to mark the sombre anniversary of the powerful earthquake that shattered their country one year ago. At 4:53 p.m. ET — the moment the quake hit Haiti — residents of Port-au-Prince waved their hands in the air in a traditional Haitian grieving custom. Prime Minister Jean-Max Bellerive said the death toll from the quake was more than 316,000, raising the figures from previous estimates on the first-year anniversary of the disaster. The victims included 58 Canadians. One million people were left homeless, and about 800,000 of them still live in makeshift tent cities. A 6 a.m. mass took place near the Presidential Palace, and more masses were planned in all the major churches in the country. The United Nations will hold a memorial for UN personnel who lost their lives in the quake. CBC's Connie Watson reported from Port-au-Prince that while many official ceremonies have been organized to mark the earthquake anniversary, it is in the tent cities that people are reminded every minute of their loss. "What happened January 12, I feel the pain," said Luckner Daldomble. "I lose my wife with two children. And God give me my life. I lose three house. I don't worry about that. I worry that my wife and my kids are lost." Many of the residents of the tent camps said they planned to go to the nearby cemetery to mark the anniversary of the quake. 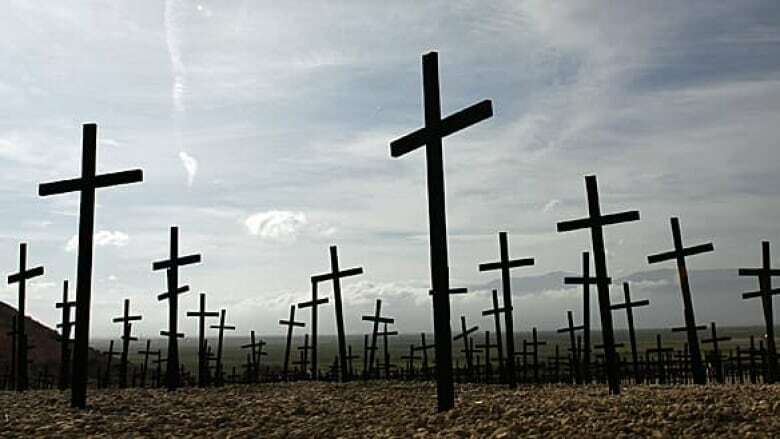 Covered in black crosses, the cemetery is the site of three mass graves filled with unknown victims of the earthquake. At a monument in a city park, Karlenz Almon lit a candle for his wife. After the quake, he said, he spent five hours trapped under rubble. "My neighbours dug me out," he said. "What I thought was debris weighing on my back was actually the body of my wife. She was dead. It terrified me." Almon still doesn't know what happened to his missing sister. 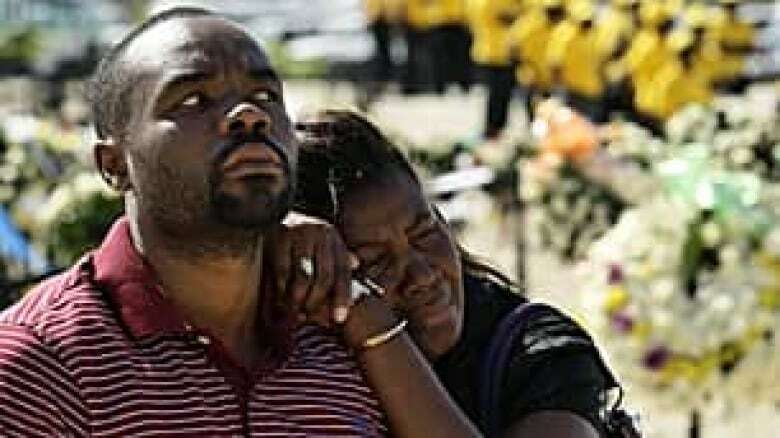 Haitians in Canada are also mourning the loss of family and friends in the quake. Over the weekend, members of Montreal's Haitian community packed St. Joseph's Oratory for an emotional ceremony that brought many to tears. Canadians across the country marked the anniversary Wednesday. In Montreal, home to the largest Haitian diaspora in the world, numerous events were planned. La maison d'Haiti, a cultural hub, threw open its doors and welcomed anybody feeling sorrow over the anniversary, said CBC's Dan Halton. There were also be fundraisers in the city, including one to help provide chicken farms for single mothers in Haiti, and another to support sustainable building projects in the country. In Port-au-Prince, Daldomble said there is a great sadness, and a great frustration that people are still living much like they were when they fled the earthquake. Even though 12 months have passed since the quake, little renovation has taken place and a recent cholera outbreak in the areas surrounding the capital has killed an additional 3,000 people. Residents have also taken to the streets in violent protests over what they consider a fraudulent presidential election. Michaëlle Jean, Canada's former governor general and now a special UN envoy to Haiti, arrived for a 24-hour visit in the country where she was born. The trip is her first since she took on her UN post. Jean and former U.S. president Bill Clinton also attended the UN memorial. On Tuesday, Jean voiced her anger at the slow rate of aid delivery, blasting the international community for abandoning its commitments. "As time passes, what began as a natural disaster is becoming a disgraceful reflection on the international community," Jean said in a public letter co-authored with Irina Bokova, the head of UNESCO, the United Nations Educational, Scientific and Cultural Organization. Since the quake, the Canadian government has committed $550 million to Haiti. Canadians have raised another $220 million, for a total of $770 million to help offer relief. On Tuesday, the federal government announced where a portion of that money will be spent. Beverley Oda, the minister of international co-operation, announced several initiatives in Montreal aimed at helping Haitian recovery efforts. The announcement, totalling $93 million, includes a project to provide free, basic health services to three million people, the rebuilding of Haiti's midwifery school, new maternity beds and a pediatric ward.